In the Kensington Market, Victorian style houses are changed into colorful funky shops. 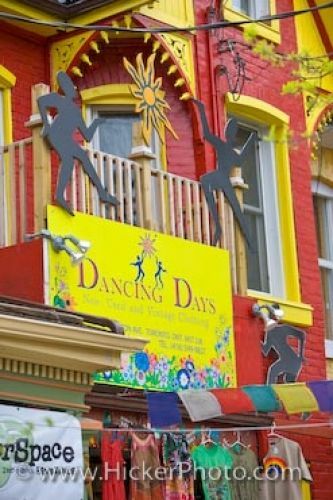 Red paint with yellow trim displays the Dancing Days shop. Black silhouettes of dancers are attached to the store front. Clothing hangs on the front of the shop. Make sure to see our photo gallery Toronto City photos. Victorian style houses are used to display funky shops in the Kensington Market, Toronto.